Poll: Where will you get your Christmas tree? 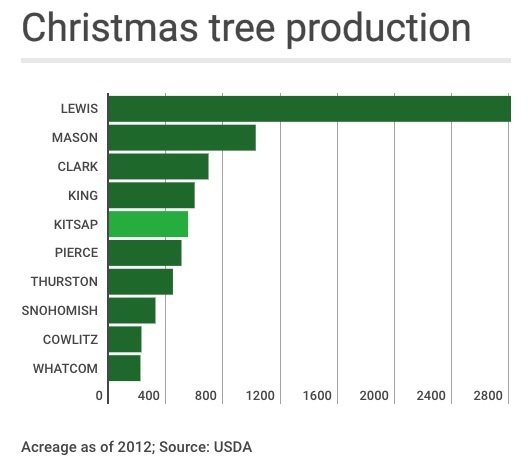 Kitsap residents have a bounty of options when it comes to picking a Christmas tree. There are, of course, no shortage of stores and tree lots offering pre-cut firs, pines and spruces. For families who want to harvest their own, the county home to more than 500 acres of planted Christmas trees, with U-cut farms dotted across the peninsula. More adventurous tree hunters can buy a $5 permit from the Forest Service and make a foray into the Olympics. If you need help finding a tree this year, the Kitsap Sun has a handy guide to u-cut farms and lots on the peninsula. Photo by Larry Steagall. See a gallery of Larry’s Christmas tree shots here.